My recent trip to Banff was so beautiful in so many ways, but our hotel experience definitely stood out to me. We stayed at the Elk + Avenue, which is conveniently located right outside of downtown Banff on Banff Ave. Amongst the hotels on our block, Elk + Avenue definitely seemed the most modern, and newly renovated, which was a refreshing sight in this small mountain town. Right when you walk in, you’ll notice the modern finishes in the bright, open concept lobby/check-in area. I absolutely loved the tones and textures that the hotel featured. The decor was simple but very beautiful, while still holding its Canadian, PNW feel. Walking past the lobby, you walk into an inviting seating/lounging area which looks like a beautiful living room. I felt like this space was designed for me—from the blue accent walls and wood finishes, to the neutral colour palette and grey velvet arm chairs…everything in this space is exactly how my dream living space would look like. The interior designer who did this space totally killed it and they created the perfect resting area for those coming back from skiing or even for you to lounge and read when you’re hanging out at the hotel. We stayed in a room with two queens on the first floor, and it was super cozy and cute. It had the same gorgeous modern wood finishes all though out, a glossy white night stand, and a wood media console. The hotel also has loft suites, regular king rooms, deluxe king and queen rooms, and junior suites that have amazing lighting and are beautiful. 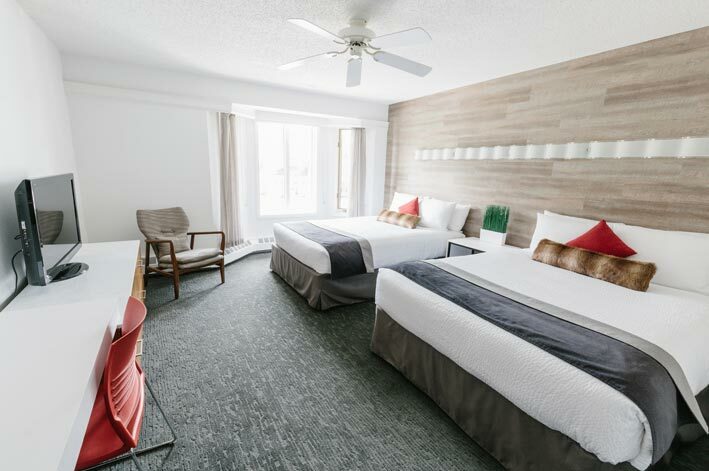 Whether you’re looking for a relaxing après-ski sanctuary or a big night on the town, this minimal yet cozy Rocky Mountain-inspired hotel is the ideal accommodation choice for exploring the best of Banff. I absolutely loved our stay at the Elk + Avenue and would definitely recommend it if you’re ever in Banff.